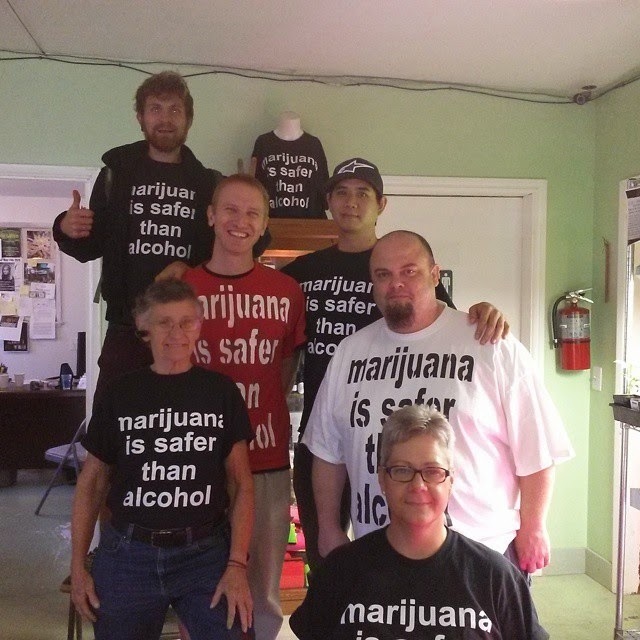 Safer Shirts: Should marijuana growers register with the state? Should marijuana growers register with the state? Why would anyone ever propose such a thing? In Washington state adults are allowed to brew small amounts of alcohol with no tax, fee, license, permit, or registry. Why would marijuana be any different? Washington voters voted yes on "legalization" what kind of "legalization" did we get? If we have legal beer, and legal marijuana, but we can brew our own beer and we are not allowed to grow our own marijuana it seems the word "legal" has different meanings depending on the context. What are we teaching children about the word "legal"? We are confusing the hell out of them is what we are doing. Here is a picture under which one of my friends accused one of my co-workers of supporting a medical marijuana patient registry. I personally think a patient registry is a horrible idea. Requiring patient/growers to register with the state is bad, I would go even further and say that requiring any adult small garden grower (patient or not) to register with the state is bad. I'm surprised representatives in Washington state would treat marijuana any other way now that the people who put them in office voted yes on "legalization". Legal beer, no registry for homebrew. An obvious extension of that is legal weed, no registry for homegrow. It is not rocket science. Hopefully lawmakers in Washington can get it figured out. Prohibition doesn't make any sense. Legalization can make sense, if we let go of the pandering and embrace the scientific truth, that marijuana is safer than alcohol. Look here for Real Legalization in Washington state.